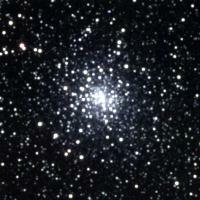 Messier 28 (also known as M28 or NGC 6626) is a w:globular cluster in the w:constellation Sagittarius. It was discovered by w:Charles Messier in w:1764. M28 is at a distance of about 18,000 to 19,000 w:light-years away from w:Earth. 18 RR Lyrae type w:variable stars have been observed in this cluster. In w:1986, M28 became the first globular cluster where a millisecond pulsar was discovered (by the w:Lovell Telescope at w:Jodrell Bank Observatory). ↑ a b c d "SIMBAD Astronomical Database". Results for NGC 6626. http://simbad.u-strasbg.fr/Simbad. Retrieved 2006-11-16. ↑ "JBO - Stars". w:Jodrell Bank Observatory. http://www.jb.man.ac.uk/tech/lovell/aunstar.html. Retrieved 2007-06-01. This page was last edited on 7 September 2009, at 12:54.